I'm a Shabby Chic girl at heart, I adore anything vintage with a little bit of wear, patina, white wash and floral, and I used this style as my inspiration for most of my romantic and assemblage jewelry creations. I have so many sweet, chic vintage jewelry findings and crafting supplies to share with you in my new supply shop. Looking at my stock, I see that I am defiantly addicted to cabochons of all sizes and types, but there is lots of aqua, pink and white! Most of my cabochons are vintage from West Germany or Japan from the 1940s to the 1960s. Vintage Hand Painted Flower Embossed Glass Cabochons Oval 13x8mm . 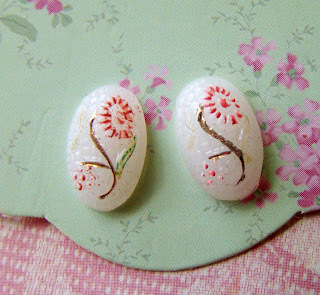 Shabby Chic vintage white pressed glass oval cabochons with hand painted pink flowers on textured background. These are very old, and each have various stages on worn paint, which create a lovely time worn look. Each little cabochon measures 13x8mm, 4mm thick with flat backs. Retro Rose Pink & Gold Drizzle Oval Glass Cabochons . Shabby Chic, retro 1960’s pink glass decorated with matte gold drizzle. Vintage, West German oval glass cabochons, measuring 18mm x 13mm with flat backs. Vintage Chic Aqua Blue Leaf Medallion Lucite Cabocohons 16x13mm . 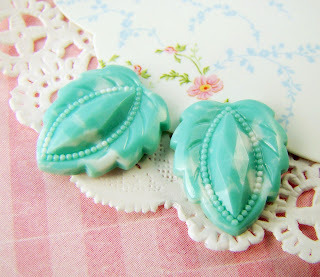 Shabby Chic 1950s vintage marbled aqua blue & white leaf medallion cabochons, with faceted navette center, each cab varies slightly. Cabochons measure 16mm x 13mm, 4mm thick with flat backs. 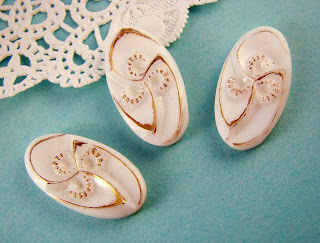 Art Deco Floral White & Gold Embossed Oval Cabochons . Shabby Chic vintage pressed glass art deco stylized flower oval cabochons are fashioned from opaque chalk white glass and hand antiqued in gold, with flat backs. These are unique and old, each piece varies in wear of the gold.